It may surprise people to know that New Jersey is the most densely populated state in America. 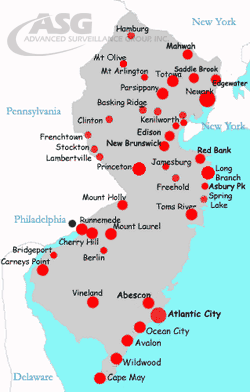 It is basically divided into three major regions: North Jersey, South Jersey, and Central Jersey. Because of its close proximity to New York City, New Jersey has many residents who live there and travel into the city to work on a daily basis. Most background check companies will only search the current county of residence. However, if your applicant works in New York there may be scores of criminal records that go undetected on your New Jersey background check. At ASG, we understand the need for a multi-jurisdictional search to make sure that you have conducted a thorough New Jersey Background check. Many states offer repositories of criminal records in one centralized location, New Jersey however does not. We review court records at the county level in order to ensure that our clients have the most accurate information possible. Our trained investigators are knowledgeable about the county lines in New Jersey and often offer complimentary additional county searches if the subject lives near a county line. We strive to create a comprehensive New Jersey background check and refuse to let state limitations force us to offer an inferior product. Please note that many online vendors will simply purchase bulk outdated data and attempt to pass that information onto their consumers as an accurate New Jersey background check. At ASG, our investigators make sure to invest the time and care into each file in order to ensure that your New Jersey background check is as accurate as possible. A.S.G. is your BEST source for an accurate New Jersey Background Investigation. Call us today and discuss your needs with an investigator at 888-677-9700. Please note that all of our searches are state specific, which means that only New Jersey based records will show up in a New Jersey background check report. We do recommend casting a wider net and enhancing your odds of detecting criminal information by conducting additional criminal records searches in additional states. Feel free to contact our office with any questions as to how we can help you form the most comprehensive New Jersey background check possible. We will tailor any investigation to suit your needs. Our New Jersey background check is fully customizable. ASG has partnered to create a secure online submission portal. We strive to eliminate unnecessary administrative time in your office and our system allows for all of your reports to be accessible within seconds. New requests can be created at the press of a button, and digital disclosure information signed by the applicant on any internet connected device. If you have any questions about our process or our online submission tool, please feel free to call our office and a trained investigator will answer any questions you may have! For more information about our process, please see our services page. We always tell our clients that the term New Jersey Background Check is a very generic one. A background check can consist of many types of searches from a multitude of different sources. We have helped to provide individuals with New Jersey background checks on people who currently or previously resided in places like: Newark | Jersey City, Paterson, Elizabeth, Edison or Woodbridge Township. Let us get the truth for you.